Americans have been proudly growing hops since early colonial times. The first commercial hop production was a 45-acre garden established in 1648 to supply a brewery in the Massachusetts Bay settlement. Massachusetts remained the country’s most important hop supplier for the next 150 years, until production expanded to other New England states. By the mid-1800s, the state of New York controlled the largest US hop acreage, reaching its peak in the last decades of the century. However, new growers along the Pacific coast would soon surpass hop production in the east. When Prohibition began, followed by an outbreak of some nasty downy mildew, the Northeast’s hop production came to a close. 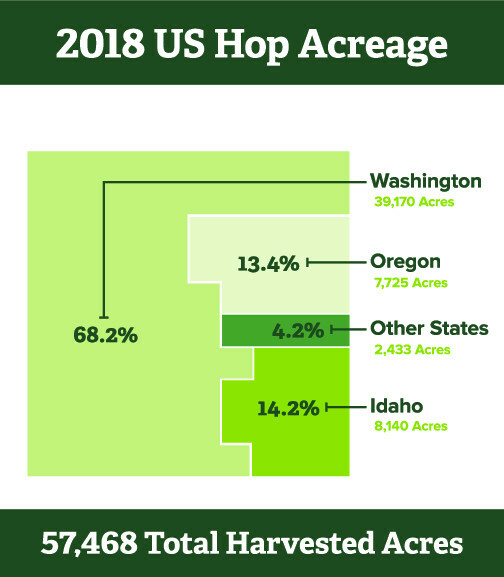 The Pacific coastal states of Washington, Oregon, and California produced the majority of the US hop crop in the early 1900s. The end of Prohibition in 1933 resulted in a considerable increase in hop acreage for these states, with Idaho expanding its acreage later, during World War II. California commercial hop production had ceased by 1990, and the Pacific Northwest continued to dominate US commercial hop production. The Northwest’s favorable climate, fertile soils, plentiful irrigation water, and multi-generational family farms have resulted in excellent quality and yields. Modern post-harvest storage and processing facilities in the region ensure the highest crop quality is maintained, while supplying the brewing industry with virtually any product it desires. Growth of the craft and specialty brewers has resulted in an increase in hop and beer lovers, which has in turn created opportunities for new hop production regions throughout the US, as well as a resurrection of hop growing in some previous production areas. These farms are generally smaller in scale than their Pacific Northwest counterparts but have the ability to respond to specific local hop market needs. 889 plants or “hills” make up one acre of hops, if planted on a standard 3.5 foot by 14 foot spacing. In the Pacific Northwest, yields average about 2,000 pounds of dried hop cones per acre on mature hop yards, or a little over two pounds per hill (yields vary depending on variety and location). Hops are typically sold in 200-pound bales. A bale will yield between 135 - 800 barrels of beer (31 gallons each), depending on the recipe.